Straight pattern globe valves are widely used in the oil and gas industry to regulate and control the flow of fluids. During operation, these valves are exposed to problems such as cavitation. The working principle of straight pattern globe valves is that flow reaches the center of the valve where the seat and plug are located. Two 90-degree rotations of the fluid inside the globe valve upstream and downstream of the plug (Figure 1) create a significant pressure drop. Significant pressure drop of the liquid services in the globe valve below the vapor pressure makes the vapor press out of the liquid. The bubbles will recover the pressure and collapse, creating pressure waves. Consequently, the pressure waves can damage the seat, plug and body of the globe valves. Cavitation can create irregular pits and erosion in the trim (seat and plug), the body, and downstream piping. Figure 2 shows cavitation damage in the form of small pits very similar to corrosion damage in the plugs of the globe valves. 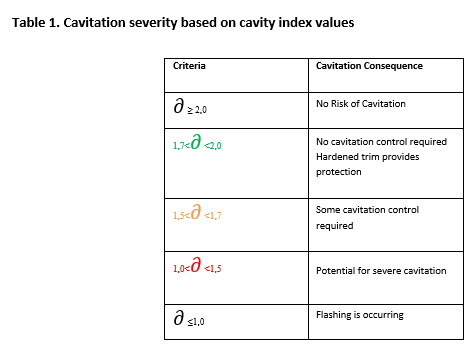 The severity and extension of the cavitation for the valves based on cavity index values is given in Table 1. 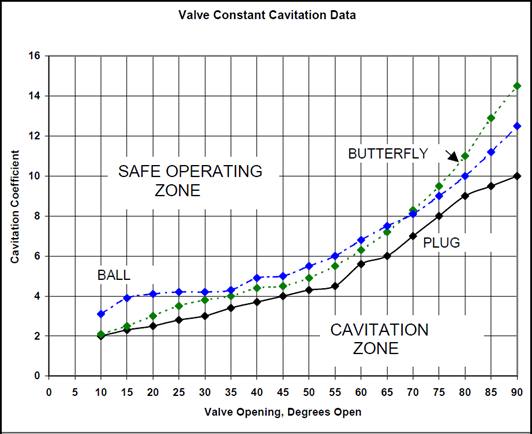 Figure 3 shows the result of flow test and cavitation coefficient development for quarter-turn valves including ball, butterfly and plug valves. Valve Size: Larger sizes of valves increase the risk of cavitation. Pressure Class: Valves in higher pressure class have the possibility of higher pressure drop and cavitation risk. Material: Harder materials such as 22Cr duplex have less risk of cavitation compared to softer material choices such as austenitic stainless steels. Additionally, hard trim materials like Stellite 6 (UNS R30006) or Stellite 21 as a form of solid or overlay and 13Cr martensitic stainless steels like UNS S41000 or 415000 have higher resistance against cavitation. Leakage: Leakage from the valve seat when the valve is closed increases the cavitation risk. Flow regime: Turbulent and high flow velocity increases the cavitation risk. 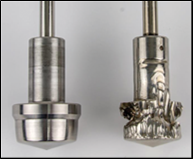 Trim Design: As an example, multi-step trim design creates a pressure drop in two or more stages to avoid high pressure drop in one stage. The other advantage of multi stage trim design is to have high pressure drop away from the seat and plug sealing areas. There are different approaches to avoid cavitation. 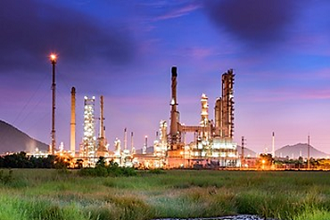 They include changing the valve and reducing the selection of globe valves. Other solutions address selection of the more robust straight pattern globe valve. The American Petroleum Institute (API) 623 standard first edition, released in 2013, includes requirements for globe valves to avoid leakage, vibration and cavitation. The API 623 standard specifies hard facing on both the seat and plug and the guided disk, especially for high-pressure classes. The stem diameter specified in API 623 follows the principles of the API 600 Cast Steel Gate Valves Standard, with different values. The stem diameter values in API 623 are larger than other globe valve standards including BS 1873, to avoid breaks such as stem and plug separation. This standard covers valves from 2- to 24-inches in diameter and pressure classes from 150 to 2500. Stellite is a cobalt-chromium alloy that is widely used for hard facing of the globe valve internal components including the seat and plug, to prevent erosion and cavitation. 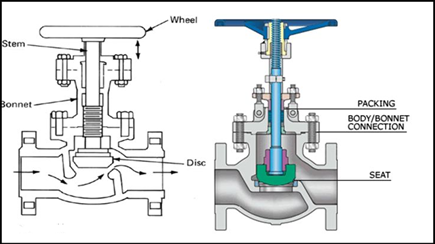 Y-type globe valves (also known as oblique valves) and axial valves (Figure 4) are alternative valve types that can be used to avoid erosion and cavitation. The flow path inside the Y-type pattern globe valve is straighter than the straight pattern globe. Axial valves as the new generation of globe valves have many advantages such as low pressure drop, quick closing and opening speed, smooth flow characteristic, low operation torque and long design life. However, axial valves and Y-type are more expensive than straight pattern globe valves regarding the cost of expenditure (CAPEX). Additionally, butterfly valves can be the preferred choice for throttling in utility services such as water, instead of globe valves. One reason to select butterfly valves instead of globe valves for throttling in sea water services is that butterfly valves are less costly, although cavitation can happen inside the butterfly valves as it does in globe valves. Cavitation is the major operational problem in the conventional T-type globe valves. Selecting hard trim materials such as Stellite, using anti-cavitation trim like multi-step type and applying the API 623 standard are recommended for designing T-type globe valves. However, selecting valves like Y-type globe or axial valves also can be a good solution for reducing or avoiding cavitation risk.